I was getting an update together to post, basic plans have been finished and I am preparing to start joining the wings to the fuselage. I dont know if it will be done in time but I will do my utmost. We would all love to hear an update on this one if you have it. Not much in the way of updates, I have been researching this (turns out almost all the information on it is classified). So I have been reading on how flying wings maintain stability and how to make sure this wont go into a flat spin with the first lateral imbalance. I have settled on a single EDF powerplant (if it isn't enough power I will double them) and a very simple airfoil. I have been considering Yaw axis thrust vectoring but that would likely result in less thrust overall. 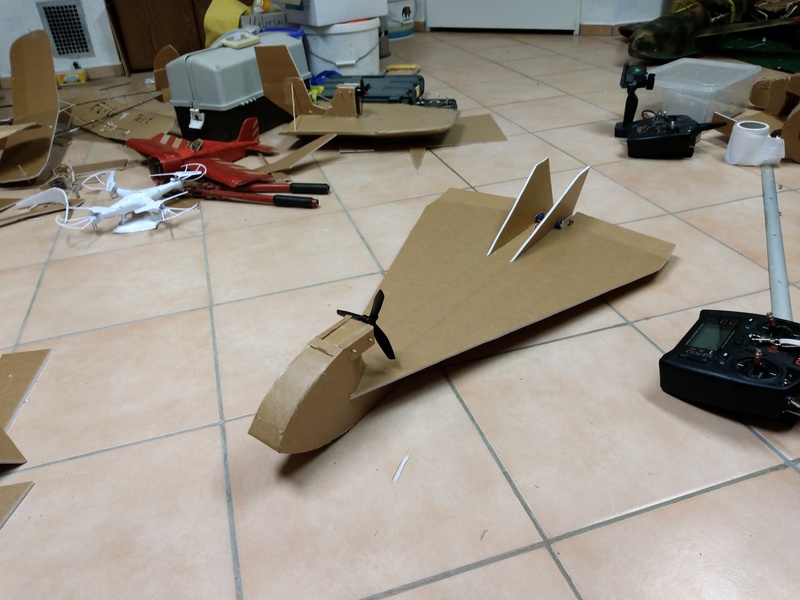 The prototype right now is a few mounting pieces for the EDF and a wing. I would expect a maiden in April/early May. Depends on how much time I have to work on this. I just want to ask. Does anyone have any problems where they start building and it just doesn't look right? because I keep having that problem, I suppose it is partially because there are no 3D views of this plan. What doesn't look right? the plan view or the side wing profile? The reason for not looking right might be the lack of a vertical stabilizer, any plane just looks plane ( ) wrong without one, although that does look pretty cool . Wow, thanks for that, I haven't found either of those images in a pixel quality to be useful. No, the thing that wasn't looking right was the height compared to width, it was to tall. I tried to remedy that by expanding the wings/fuselage but then it starts to get bigger than I am comfortable with 1 EDF. The EDF diameter is 64 mm and I decided a 3 inch fuselage height would be good to hold it. 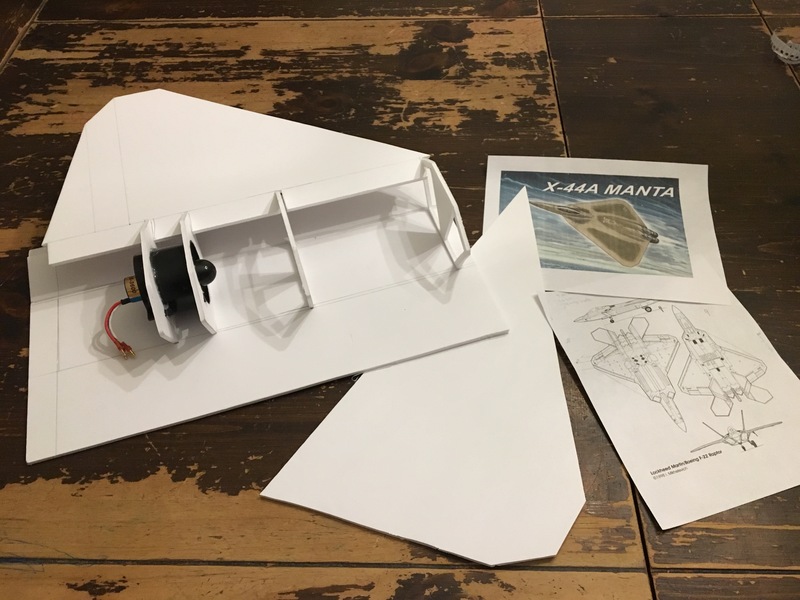 I tried a 8 inch fuselage width but as I said it doesn't look right, I guess I could try twelve inches which would expand the wings to 38 inches. I will do some more work tonight using the images you shared and maybe have a better build plan for this weekend. btw sorry I never finished the builduary contest. I have been quite busy and the plans for the planes I was building are still on my desk. Wow, thanks for that, ... I will do some more work tonight using the images you shared and maybe have a better build plan for this weekend. btw sorry I never finished the builduary contest. I have been quite busy and the plans for the planes I was building are still on my desk. i am happy you started it. i like it because I get a chance to interact with this forum's great members, and get to know everyone better. Ok small update: I started building using @FoamyDM ’s pictures (thanks again), as well as F-22 plan views, it’s coming along well so far. I am a tiny bit worried about wing loading but with balsa reinforcement and a small battery all should be fine. It’s 24 inches across and powered by a 64 mm fan. I will hopefully have another update by next weekend. Quick question, Since you can buy gyros for RC airplanes is there any way that I could combine a gyro and yaw thrust vectoring control to fly this without a tail? Just an idea. I see you have settled for a single 64 EDF. Secondly, how are you going to handle the yaw situation? Here is my video of a single F-22 64mmEDF with thrust vectoring that I designed and I still had the probem with yaw at slow speeds even having rudders. Solved the problem with "THRUSTERS" that I added which (because of the limits) reduced it to a managable amount so at least I could hover for a quick second. Also increased the high alpha angle so wings don't waggle. So, my sense is fighting yaw will be a problem you still need to solve. Secondly, if you try 2 64's, then you will have to build larger, weight goes up, and pretty soon it will take 70's to push itand the problem starts all over. First video shows 70's(I also have cw and ccw EDF's) how huge plane gets with upscale model. Listen to that power. Second video shows the controllable yaw in slow flight and trying to hover for a short length of time. So the plan for the release version will be clear plastic winglets. 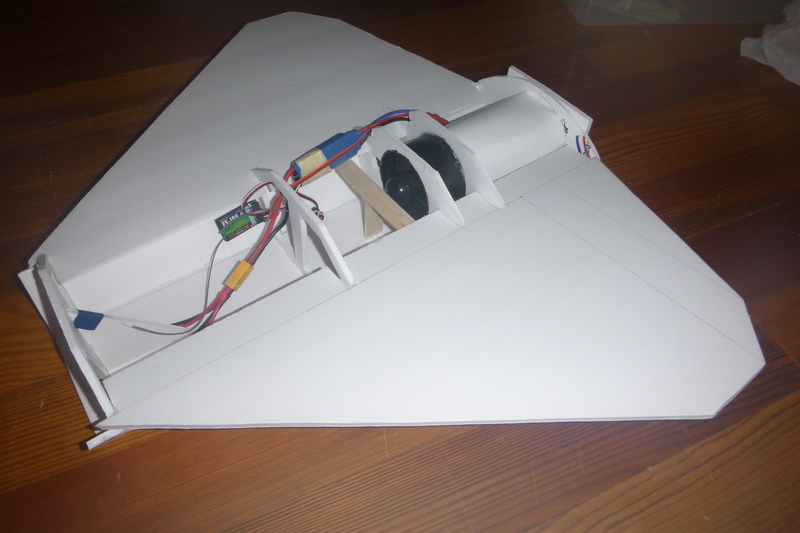 the prototype will have foamboard winglets but thats just for testing. once I have worked out the flight characteristics, I hope to try gyro controlled yaw thrust vectoring for a demonstration aircraft. I do not know how well it would work, but it might be worth an experiment. Yes, from my experience with EDFs, you have to be going fast for yaw control/stability. As for power, the 64mm I am using used to be in my FT Viggen and that was much larger and flew fine. 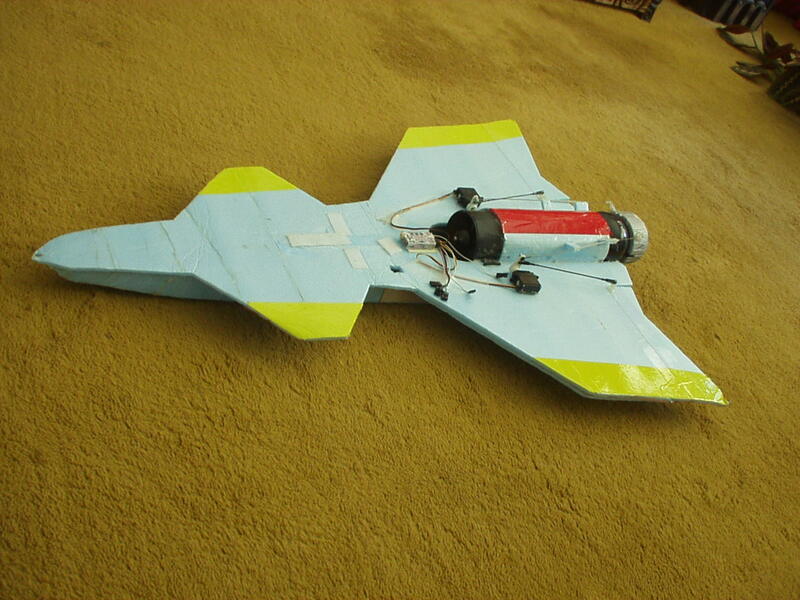 Found "Rocket Sled" in the attic to show that a single 70 EDF with thrust vectoring only and a gyro on rudder did not work. Did you know that without rudder, NASA states your drag is reduced by approximately 1/3!!! With the throttle full open, it did way over 100mph. Problem was that starting any turns (tried both left and right) or fast or slow, I got into trouble. It would only fly straight, so got it back by doing a split S . Was at a grass sod field that was huge. Going for it up real high in air, ended up destroying 1 70EDF and battery. Second attempt made it back with a nose crunch, gave up. Too expensive. The build is progressing nicely. I added the second wing, built the walls into the side of the fuselage. 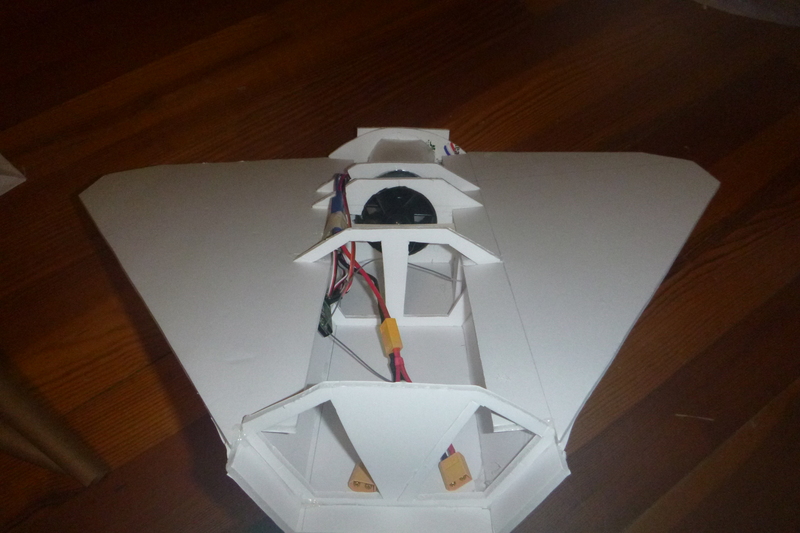 Added a thrust tube (the toughest part of the build so far), added servos and ESC and started designing the nose. Current weight is 400 grams and should finish weighing at about 600 grams. the build will probably be 3 foam sheets, 2 servos, one 70 or 64 mm EDF and a ESC rated for it. In case anyone is wondering why there is a y battery harness, I dont have a battery extension at the moment and so I use this y harness with a piece of tape on one of the connectors. This and my experience with the Lippisch P13a (check my profile pic) showed me that these deltas have their CG very much at the front. Maybe your EDF is too far back, you should better check it before you cover everything up. If you want, I could cut the vertical stabs away from this thing. Swept wings are usually yaw stable, check the Horten 9 for example, it didnt have vertical surfaces and flew severel times before one engine failed. The FT Arrow can also fly without vertical surfaces. My prototype has a big surface in front of the CG, that might make it unstable, but there is also super much wing area bihind the CG. Modern fighter planes or stealth planes are build aerodynamicly unstable, because that helps with stealth and makes them more maneuverable. But there is no reason why an RC plane cant fly. Im going to try without vstabs and Im going to tell you how it went. I hope this helps you a little and good luck with building/flying! Yes, CG on deltas is very far forward. I probably will have to revise that, i am hoping right now that a 2200 3s will balance it but if that doesnt work then I will rebuild it with the EDF in the center. Unfortunately in my research of flying wings, I found they are quite particular in what the angle of the wing should be, do you notice almost all flying wings have the same sort of wings? The YB-49, Ho 9, Ho 229, Kraken, all have the same sort of wing sweep angle. I am pretty sure that provides directional stability. We shall see though.